大鼠 IGF1 ELISA Kit | ABIN411285 Product No. 交叉反应 （详细） There is detectable cross-reactivity with IGF-2< 1 % . Protein Function: The insulin-like growth factors, isolated from plasma, are structurally and functionally related to insulin but have a much higher growth-promoting activity. May be a physiological regulator of [1-14C]-2-deoxy-D-glucose (2DG) transport and glycogen synthesis in osteoblasts. Stimulates glucose transport in rat bone-derived osteoblastic (PyMS) cells and is effective at much lower concentrations than insulin, not only regarding glycogen and DNA synthesis but also with regard to enhancing glucose uptake. May play a role in synapse maturation (By similarity). .
Background: Insulin-like growth factor 1(IGF-1) that was once called somatomedin C, is a polypeptide protein hormone similar in molecular structure to insulin. It plays an important role in childhood growth and continues to have anabolic effects in adults. Human IGF1 is a single chain 70-amino acid polypeptide cross-linked by 3 disulfide bridges, with a calculated molecular mass of 7.6 kD. The IGF1 gene, mapped on 12q22-q24.1, contains 5 exons. Exons 1-4 encode the 195-amino acid precursor(IGF1B), and exons 1, 2, 3, and 5 encode the 153-residue peptide(IGF1A). The structure of IGF1 resembles that of IGF2. And the IGF1 and IGF2 genes have complex structures with multiple promoters. The expression of both genes is regulated at the levels of transcription, RNA processing, and translation. IGF-1 is produced primarily by the liver as an endocrine hormone as well as in target tissues in a paracrine/autocrine fashion. Moreover, approximately 98 % of IGF-1 is always bound to one of 6 binding proteins(IGF-BP). Furthermore, IGF-1 is one of the most potent natural activators of the AKT signaling pathway, a stimulator of cell growth and multiplication and a potent inhibitor of programmed cell death. 应用备注 Before using Kit, spin tubes and bring down all components to bottom of tube. Duplicate well assay was recommended for both standard and sample testing. Sequence similarities: Belongs to the insulin family. 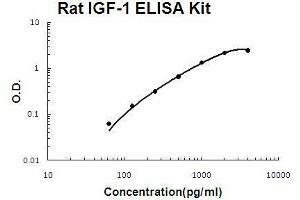 实验流程 rat IGF-1 ELISA Kit was based on standard sandwich enzyme-linked immune-sorbent assay technology. A monoclonal antibody from mouse specific for IGF-1 has been precoated onto 96-well plates. Standards(E.coli, G49-A118) and test samples are added to the wells, a biotinylated detection polyclonal antibody from goat specific for IGF-1is added subsequently and then followed by washing with PBS or TBS buffer. Avidin-Biotin-Peroxidase Complex was added and unbound conjugates were washed away with PBS or TBS buffer. HRP substrate TMB was used to visualize HRP enzymatic reaction. TMB was catalyzed by HRP to produce a blue color product that changed into yellow after adding acidic stop solution. The density of yellow is proportional to the rat IGF-1 amount of sample captured in plate. Aliquot 0.1 mL per well of the 4000pg/mL, 2000pg/mL,1000pg/mL, 500pg/mL, 250pg/mL, 125pg/mL, 62.5pg/mL rat IGF-1 standard solutions into the precoated 96-well plate. Add 0.1 mL of the sample diluent buffer into the control well (Zero well). Add 0.1 mL of each properly diluted sample of rat cell culture supernates, serum or plasma(heparin, EDTA) to each empty well. See "Sample Dilution Guideline" above for details. 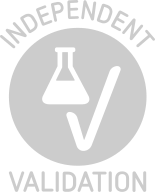 It is recommended that each rat IGF-1 standard solution and each sample be measured in duplicate. 注意事项 Avoid multiple freeze-thaw cycles. 有引用在： Yang, Wu, Feng, Huang, Liu, Liu, Chen: "Vitamin C plus hydrogel facilitates bone marrow stromal cell-mediated endometrium regeneration in rats." in: Stem cell research & therapy, Vol. 8, Issue 1, pp. 267, 2017 (PubMed). Ozdemir, Aksu, Baykara, Ates, Sisman, Kiray, Buyuk, Uysal: "Effects of administration of subtoxic doses of acetaminophen on liver and blood levels of insulin-like growth factor-1 in rats." in: Toxicology and industrial health, Vol. 32, Issue 1, pp. 39-46, 2016 (PubMed). Cai, Tan, Zhang, Li, Wang, Zhu, Wang, Yang, Wang, Liu, Xu, Pan, Wang, Yang, Lu: "Mesenchymal Stem Cells and Cardiomyocytes Interplay to Prevent Myocardial Hypertrophy." in: Stem cells translational medicine, Vol. 4, Issue 12, pp. 1425-35, 2016 (PubMed). Hou, Wan, Wang, Li, Wang, Yao, Feng, Jing, Lu, Jia, Peng: "Let-7a inhibits migration of melanoma cells via down-regulation of HMGA2 expression." in: American journal of translational research, Vol. 8, Issue 9, pp. 3656-3665, 2016 (PubMed). Niu, Kou, Zhou, Ding: "Heshouwu decoction, a Chinese herb for tonifying kidney, ameliorates hypothalamic-pituitary- testicular axis secretion in aging rats." in: Neural regeneration research, Vol. 7, Issue 21, pp. 1611-7, 2015 (PubMed). Chen, Yang, He, Song, Liu: "Effect of sericin on diabetic hippocampal growth hormone/insulin-like growth factor 1 axis." in: Neural regeneration research, Vol. 8, Issue 19, pp. 1756-64, 2014 (PubMed). Wang, Wang, Liang, Liu, Shi, Bai, Lin, Magaye, Zhao: "Expression and clinical significance of IGF-1, IGFBP-3, and IGFBP-7 in serum and lung cancer tissues from patients with non-small cell lung cancer." in: OncoTargets and therapy, Vol. 6, pp. 1437-44, 2013 (PubMed). Cai, Li, Wang, Liu, Yang, Chen, Yin, Tan, Zhu, Pan, Wang, Lu: "Apoptosis of bone marrow mesenchymal stem cells caused by homocysteine via activating JNK signal." in: PLoS ONE, Vol. 8, Issue 5, pp. e63561, 2013 (PubMed). Aksu, Baykara, Kiray, Gurpinar, Sisman, Ekerbicer, Tas, Gokdemir-Yazar, Uysal: "Serum IGF-1 levels correlate negatively to liver damage in diabetic rats." in: Biotechnic & histochemistry : official publication of the Biological Stain Commission, Vol. 88, Issue 3-4, pp. 194-201, 2013 (PubMed). Ni, Sun, Fu, Wang, Guo, Tian, Wei: "IGF-1 promotes the development and cytotoxic activity of human NK cells." in: Nature communications, Vol. 4, pp. 1479, 2013 (PubMed). Baykara, Aksu, Buyuk, Kiray, Sisman, Baykara, Dayi, Tas, Ozdemir, Arda, Uysal et al. : "Progesterone treatment decreases traumatic brain injury induced anxiety and is correlated with increased serum IGF-1 levels; prefrontal cortex, amygdala, hippocampus neuron density; and reduced serum ..." in: Biotechnic & histochemistry : official publication of the Biological Stain Commission, Vol. 88, Issue 5, pp. 250-7, 2013 (PubMed). Iseli, Hedinger: "Histopathology and ultrastructure of primary adrenocortical nodular dysplasia with Cushing's syndrome." in: Histopathology, Vol. 9, Issue 11, pp. 1171-94, 1986 (PubMed). 背景 Ozdemir, Baykara, Aksu, Kiray, Sisman, Cetin, Dayi, Gurpinar, Uysal, Arda: "Relationship between circulating IGF-1 levels and traumatic brain injury-induced hippocampal damage and cognitive dysfunction in immature rats." in: Neuroscience letters, Vol. 507, Issue 1, pp. 84-9, 2012 (PubMed). Sussenbach, Steenbergh, Holthuizen: "Structure and expression of the human insulin-like growth factor genes." in: Growth regulation, Vol. 2, Issue 1, pp. 1-9, 1993 (PubMed). Rotwein, Pollock, Didier, Krivi: "Organization and sequence of the human insulin-like growth factor I gene. Alternative RNA processing produces two insulin-like growth factor I precursor peptides." in: The Journal of biological chemistry, Vol. 261, Issue 11, pp. 4828-32, 1986 (PubMed). Rinderknecht, Humbel: "The amino acid sequence of human insulin-like growth factor I and its structural homology with proinsulin." in: The Journal of biological chemistry, Vol. 253, Issue 8, pp. 2769-76, 1978 (PubMed).